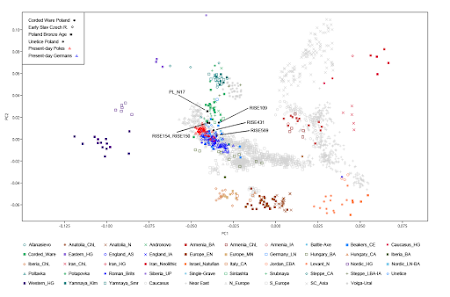 PL_N17, an Early Bronze Age genome from Gustorzyn, Northern Poland, recently uploaded to the European Nucleotide Archive (ENA) under accession number SAMN04633627, belongs to Y-chromosome haplogroup R1a-Z280. R1a-Z280 today shows very high frequencies (>50%) and relatively high SNP diversity in Northern Poland. This is a strong argument for genetic continuity in Northern Poland since the Early Bronze Age. The analysis was run by Vladimir Tagankin from YFull, who, I'm told, is also pretty sure that PL_N17 falls under SNP R-S24902. Interestingly, R-S24902 is an extremely rare marker that currently appears to be most common in Northwestern Europe. But I'd say that there are two very good reasons for this: 1) most Y-chromosomes tested at this sort of level are from Northwestern Europe and 2) today Northwestern Europe shows higher genetic diversity than Eastern Europe. So I expect this pattern to be repeated for many other high resolution ancient Y-chromosome samples from Central and Eastern Europe. Update 19/06/2017: Here's a Principal Component Analysis (PCA) featuring PL_N17 alongside several other ancient samples from Poland and the Czech Republic. Do you think Slavs have modern Eastern Europe most of its R1a? Balts used to occupy a much larger area than they do now, and they surely were always rich in R1a. What's the context? Is this the guy that had his head modeled way back? 1900 BC is the 1a phase of Trzciniec Culture and in Gustorzyn there are early Trzciniec Culture graves. So it is probably Slavic. Did Slavs absorb/conquer any Balts though? 1900 BC is also the Iwno culture. Given that this subclade is rare in modern Slavs, it's a stretch to call this man Slavic. Also, there was no such language as Slavic in 1900 BC. He'd be para-Balto-Slavic, if we wanted to create a term for it. In a recent report in Russian Academy the age of Slavic expansion was proposed at 200 AD. This date was calibrated with genetic data. Pshevorskaya ana Zarubinetskaya cultures were proposed as homeland. In about 80% of former Baltic territory. @ Aram Well, even Lev Kleyn criticized the association of Slavs with these cultures. Lev Kleyn criticizes most of things proposed by genetic studies. :) Yamna theory included. Ancient DNA is needed to rule out this proposal. David, would it be correct to say that, at first approximation, modern day Serbians basically represent a hybrid population of an old 'Italian' type population and an 'old' Polish type population? Don't think so. You won't get Serbs by mixing just Italians and Poles. This EBA dude from Gustorzyn is very similar to Estonian Corded Ware. I'll put up a new blog post about his genome-wide results later today. I'll wager Poland or basically the wider circum-Tripolyean region is the homeland of middle-late Proto-Indo-European. The oldest known members of now popular R1 clades; R1a-Z94, R1a-Z280, R1a-Z284, R1b-U152, R1b-DF27, R1b-L21 all are basically the same genetically and lived between 2900 and 2000 BC. SVP42 Y DNA R1a ZZ94, mtDNA U5a1c. Russia, 2925-2536 BC. RISE61 Y DNA R1a Z284, mtDNA J1c4. Sweden, 2851-2492 BC. PL_N17 Y DNA R1a Z280, mtDNA --. Poland, EBA. 4 of 6 have EEF mtDNA, 2 of 6 have Steppe mtDNA. Yep. All Catacomb and post-Catacomb folks were pretty much similar. David, I doubt clade Z280 exceeds 50% in Northern Poland. Most likely it reaches only about 40% among the ethnic Kashubians in Eastern Pomerania, and very similar levels are seen in many East Slavic populations. However, the diversity in both cases is rather low, as the Kashubian R1a-Z280 is strongly dominated by just one (much more downstream) subclade R1a-L365 (Pomeranian), while an equally young East Slavic subclade R1a-YP569 (under Z92) is by far the most common Z280 species among the Belarusian. In Russia, two dominant Z280 subclades are R1a-YP569 (East Slavic) and R1a-Y2902 (Volga-Carpathian). All these subclades are about 2000 years old and seem to be strongly associated with the Early Slavic expansion. Also, it should be noted that about 99% of Balto-Slavic R1a-Z280 falls under two major subclades, CTS1211 and Z92, so the (CTS1211+Z92)/S24902 ratio is much higher in Central-Eastern Europe than in Western Europe, and thus I wouldn't blame the overrepresentation of the Western Europeans among the FTDNA customers for the scarcity of S24902 among the Balto-Slavs. Ancient genomes have revolutionized our understanding of Holocene prehistory and, particularly, the Neolithic transition in western Eurasia. In contrast, East Asia has so far received little attention, despite representing a core region at which the Neolithic transition took place independently ~3 millennia after its onset in the Near East. We report genome-wide data from two hunter-gatherers from Devil’s Gate, an early Neolithic cave site (dated to ~7.7 thousand years ago) located in East Asia, on the border between Russia and Korea. Both of these individuals are genetically most similar to geographically close modern populations from the Amur Basin, all speaking Tungusic languages, and, in particular, to the Ulchi. 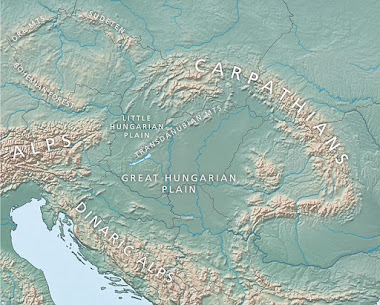 The similarity to nearby modern populations and the low levels of additional genetic material in the Ulchi imply a high level of genetic continuity in this region during the Holocene, a pattern that markedly contrasts with that reported for Europe. You're missing the forest for the trees. It's not a coincidence that an ancient Z280 has turned up in this part of Europe. Expect many more. Have I ever said it was a coincidence? I wouldn't be surprised by finding Z280 even much further west (and much further east), and at much earlier date. You missed the point I was trying to made. It's probably not a coincidence that this was Z280>S24902 and not any of the Balto-Slavic subclades under Z280. This seems to be a very important information, and you are apparently trying to play it down (for whatever reason). BTW, where did you get the information that "R1a-Z280 today shows very high frequencies (>50%) and relatively high SNP diversity in Northern Poland"? Also, please note that I have actually predicted finding S24902 in the pre-Slavic Northern Poland: http://www.anthrogenica.com/showthread.php?6522-Early-Medieval-aDNA-from-Poland-coming-soon&p=194209&viewfull=1#post194209. As another commenter also pointed out, in addition to being very similar to the Estonian Corded Ware sample, it's also remarkably close (maybe even closer?!) to Poltavka I0432 as well as Sinstashta RISE 395. Clearly, a case of common descent from Eastern Corded Ware. On that note, is there any reason why Estonian Corded has much lower ANE than German Corded by 5-10%? Have we established with 100% certainty that Corded Ware is a result of a Yamnayan migration or is that still up for debate? At one point, I considered that maybe CW was a result of Samaran HGs (mostly R1a) adopting Yamnayan culture and spreading westwards along a northern route while Yamnaya spread westward along a more southern route (leading to R1b in Bell Beaker). If I recall correctly, Samaran HG was something like 25% CHG and 75% EHG while Yamnaya was 50/50 and the CW EHG:CHG ratio was higher than it should be if it was descended from Yamnaya. Could that be why Estonian CW has less EHG than German CW? German CW was a direct migration by Yamnayan males while Estonian CW was mostly Samaran HGs who had less ANE? Not sure if this is probable since Karelia seems to have had as much or more ANE than Yanmnaya, so might be wrong here. In any case, I doubt this individual or his tribe has much of a connection with Balto-Slavs. As Michal points out, proportionally, his R1a-Z280 lineage is very rare in the East and also his K7 proportions are very different from all Balto-Slavs who are curiously much closer to German BB and Unetice. Would that mean that Corded was largely pushed out of Central and Eastern European back onto the steppes (Sintashta) during the MBA/LBA by BB and Unetice/Urnfield and that the origins of Balto-Slavs lie somewhere among these C. European MBA cultures? Samara HG is 100% EHG. Come on, it's very difficult to take anything you say seriously when you get this sort of stuff wrong. As Michal points out, proportionally, his R1a-Z280 lineage is very rare in the East. Jesus Christ, it's rare everywhere, just more common among the group of people who take the right tests more often: Northwest Europeans. Think about it. But Z280 is very common in Eastern Europe. It's one of the most common lineages there. Maybe my memory is a little off, but I could swear the Samaran sample had some CHG in it no? From the latest study on the Baltic HGs, the EHG sample starts showing the CHG element at K12 and beyond. Is that just an artifact of ADMIXTURE? It is doubtful that z280 - Slavic or Baltic subclade. This token is found in a representative of the Lusatian culture - high culture of the bronze age, which the Slavs do not have any relationship. Balta is a small group of the population on the coast of the Baltic sea, which is why it is credited with the global spread is pure myth.